It’s no understatement or exaggeration to say I have fallen in love with other works from Isherwood’s ouvre. There are characters he created that I’ve thought about extensively, even obsessively. He portrayed aestheticism, partnership, pain, and daily mundane rituals in ways I devotedly strive to mirror in my own life. Isherwood is why I claim a little gay man lives inside my belly. So encountering this quote before such a popular play, which I knew nothing about, foreshadowed a possibly familiar context colored by Isherwood’s typically polite yet passionate emotional climates. I was ready. Then the host bounced onto the stage, a part played by the talented and award-winning actor Phil Taylor. His Emcee character worked at a nightspot called Kit Kat Klub, and he introduced to the audience each Kit Kat Girl, describing each dancer. (“Helga is a baaaaby.”) We met the Kit Kat crew on New Year’s Eve, and this coterie of characters were forthright with their introductions. Actors at the front of the stage stared into the audience, and the Emcee spoke to patrons in the front rows. I immediately grasped the interactive and intimate nature of Cabaret, but I also saw that director Rachel Bertone had restrained her actors. The Kit Kat Girls’ choreography was great but also overly calculated. Despite the thespians’ bold gazes into the orchestra section and the Emcee speaking to the audience, the fourth wall remained effectively unbroken. A disappointingly tame barrier was maintained between the audience and actors. The BCA auditorium was regretfully underemployed, with patrons glued to our seats and the Kit Kat Girls’ perfectly plotted (almost robotic) dance steps. I repeatedly wished that Bertone had directed the show in a less linear A → B → C → … fashion. I wished Bertone had let her actors off the leash. I wanted the Emcee amongst the audience. I wanted the dancers to ooze more eroticism. I wanted Clifford Bradshaw to yell louder and more pleadingly at Sally Bowles. Because sitting in the audience, I felt what a staple Cabaret was to those around me. Patrons loyally clapped and called “oooooh” and “aaah” and “The Emcee is wonderful!” But I suspect we could have handled an even saucier Cabaret show. The performance continued to be disjointed and depthless until, not surprisingly, Sally Bowles crooned “Maybe This Time” when for the first time we get to see a woman who is desperate for hope; desperate for a life that is more than constant partying. Actress Aimee Doherty poured her heart through her vocal chords for this song, and the audience finally felt the show’s pulse. We collectively erupted with thunderous applause, and subsequently the entire cast finally warmed up. Across the board, acting become more natural and confident. There was cohesive synergy flowing through the cast. The night I attended, “Maybe This Time” was the turning point when every actor on the stage – not just Phil Tayler – became saturated in their character. Though the parts of this play often seemed divorced from each other, it was evident that those parts were independently executed well. A shoutout to Jared Troilo who played Clifford Bradshaw and showcased a most admirable Americanism. Dan Rodriguez was the shy Music Director, playing the accordion and piano and directing the lively band. How I wished the band could have kept playing during intermission! Gratitude to Janie E. Howland, who designed a set that was interesting to look at for this entire theatre experience. Howland placed on stage fake walls with jagged lines, sharp edges, doors behind which were hidden secret activities. 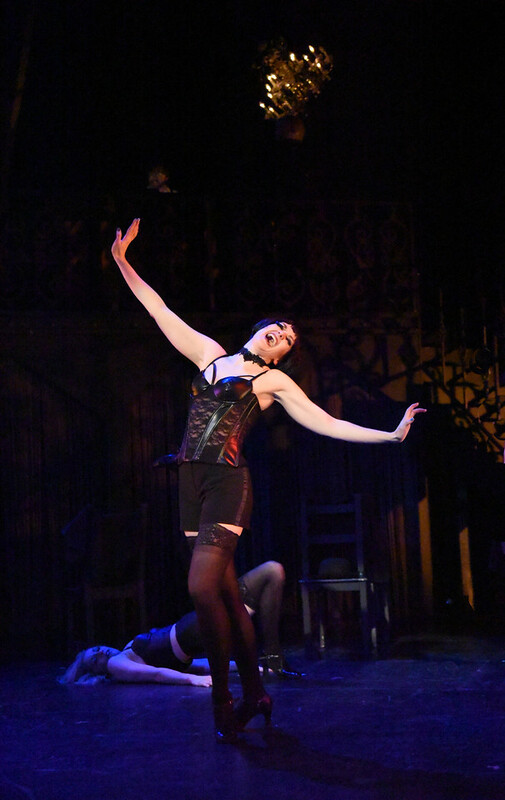 Howland’s scenery physically represented Cabaret concepts – sharp turns in life that change you forever, and the dangerous edges of fascist politics. I assume that I and many others in the audience at Wimberly Theatre left thinking that the elements of this play did not convincingly gel together. For when the play ended, there were ten seconds of uncertain silence, until one lone patron began the round of applause. I want to mention one last time that everyone ultimately did their part well, but there was not enough mature guidance from the core production team (producer and directors) to meld all of the parts into one integrated whole. This entry was posted in Musicals and Opera and tagged 2018, Aimee Doherty, April, Bishop C. Knight, Boston, Cabaret, Christopher Isherwood, Clifford Bradshaw, Dan Rodriguez, Fred Ebb, Janie E. Howland, Jared Troilo, John Kander, MA, Phil Tayler, Rachel Bertone by Bishop C. Knight. Bookmark the permalink.